I finally finished my Bee blocks for September. First up are the blocks for do. Good Stitches, Joy Circle. 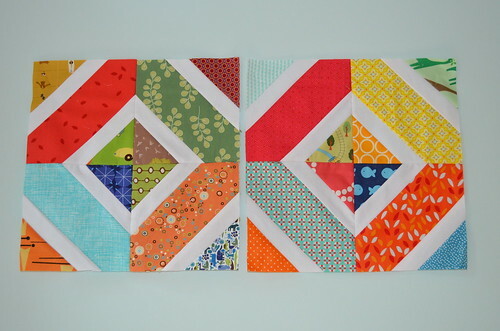 This month we made boyish Hugs & Kisses blocks from this tutorial. This was a fun block to make and I do love the white lattice design. I can't wait to see the whole quilt. 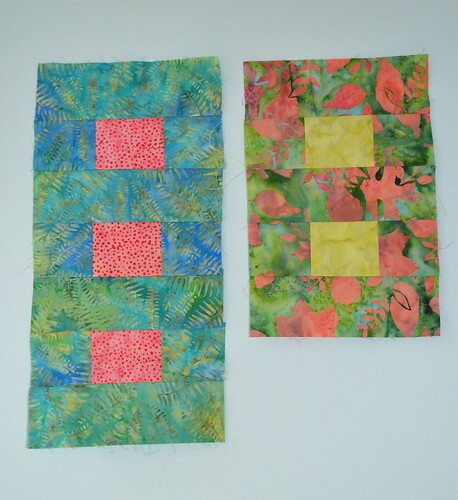 Up next are my bee blocks for Aud in the Sewn Together Bee. These are my major goof off. We were warned that there wasn't much spare fabric, and I still made a cutting error. Luckily, Aud is as nicie as can be and thinks she has a spare bit of the batik fabric needed to finish my block. I do have all the remaining pieces except one, I just couldn't finish more of the block without it. Beautiful blocks! I love the do. Good ones, they remind me of Faith's Prism pattern that I love. I need to get on and make those hugs and kisses! I love how bright the hugs and kisses blocks turned out. And I too almost cut off to much in my trimming! It's hard to see on batiks!